It’s that time of year when kids go back to school, football is starting, baseball is ending, Mr. Autumn Man is walking down the street with his coffee, and television’s top shows come back for their big premieres. Twitter has been positioning itself in the mind of network execs as a platform that is complimentary to TV, and user numbers seem to support their claims. In fact, 85% of users active on Twitter during primetime TV hours tweet about TV, with 66% saying they like to see Tweets from official show accounts according to a survey from FOX, db5, and Twitter in May. Live-Tweeting from cast members during show premieres had 64% more Tweets that day compared to programs that did nothing. Shows that live-Tweeted from the official handle also saw a 7% increase over those that did nothing. 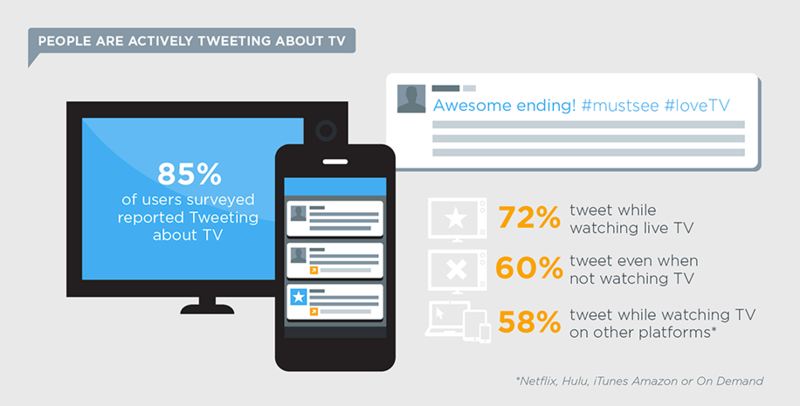 When a show DOES live-Tweet, that lift increases 15%, to 7.5x. When a cast member live-Tweets, their follow rate increases 228% to 12.2x . Now while all this research is great, it’s really supporting a gut belief that many TV marketers already realize: The problem (and reason why more TV shows aren’t participating) is a lack of knowledge into the most effective strategies for audience building online, and the miscommunication that occurs between marketing and production teams as a result. So, how can TV social teams take advantage of the benefit that comes from increased communication on Twitter? Most notably, ABC’s Scandal flooded Twitter with conversations during broadcasts, using hashtags like #AskScandal to connect audiences to the star Kerry Washington, creator Shonda Rhimes, and the rest of the show’s cast, writers, and even makeup artists in real time. The problem is TV stars (and celebrities in general) are not always the easiest to motivate when it comes to getting them to tweet for themselves. That’s going to take some work, but the best way to solve this problem is to bring the digital team into the production process as early as possible. Set up a season strategy guide and kickoff meeting for cast members, directors, and crew. Tell the production team the story of their audience members online. The social team probably has a much better view into real conversations taking place, so provide those insights to the cast and crew as they’re engaging. In your strategy guide, include a look into what the show’s branded accounts are doing, official hashtags (and fan hashtags), and let them know that the team is there to regularly provide them with assets to share on their accounts (even going so far as including pre-written, suggested tune-in tweets if you have to). If you can, connect your cast accounts into your social relationship platform. Often times cast members (or their assistant/personal community manager) slack on posting, or in many cases are not great at creating and engaging in social. A social relationship platform enables a network to push content directly through the cast member’s Twitter and Facebook accounts in these cases, in addition to gaining access to the invaluable data around that particular cast member’s social channels. Other ideas are simple: You could set up a live-tweeting schedule and assign different people to different episodes and work with them directly. Even more fun, if you can get your team together why not host cast/crew parties where everyone watches and and tweets together? A tweet is both the new applause and the new boo. Why not anticipate (and prime) these emotions? Work with production teams to find potential “tweetworthy moments” ahead of time. Lay out the types of keywords people might say to anticipate those results. Listen for those moments and reactions to them using social listening tools. Plan your live-tweeting and moderation around these moments, and set up moderation streams inside of your moderation software to easily segment tweets about your show based on keywords that determine sentiment, intent, interest in a certain character, the possibilities are really endless. Make a game plan that actually schedules out those peak moments for the community team to prep for in advance. Write it down on paper if you have to, just like production teams have shot sheets. For example, let’s say your show airs at 8pm and it’s an hour long. You know that roughly around the 5, 10, and 40 minute mark (give or take for commercials) are these “tweetworthy moments.” You might want to list those out so you can plan content and prep for a rush of conversation during those times. There are a lot of ways you can execute on these “tweetworthy moments.” Aside from live-Tweeting staples like photos, videos, and text-based tweets, a reality show might set up a social poll to tweet out to their followers at the height of an episode that speaks directly to a moment in the show. Influence is real, and some conversations are just flat-out more engaging than others. There’s no way around it. In fact, the entire Twitter report supports this argument by telling social TV marketers to get their stars involved. This relationship goes both ways – not only do influential cast members hold weight, but so do celebrities and other influencers talking about your show online. However, it’s important to remember that top TV shows generate a TON of tweets in the one hour a week that their show airs. It’s impossible to respond to each and every tweet in real time, and even tougher for a TV show’s community team to decide who to respond to and about what. Put simply, the faster you can respond to high-impact discussions, the more opportunities you have to boost viral discussions around your TV show. So, if Taylor Swift is talking about Sharknado, and SyFy responds to her, two massive overlapping audiences are seeing a public conversation play out in real time. This increases the likelihood of different audiences jumping into the conversation adding to the ripple effect. And while Taylor Swift loving Sharknado is definitely awesome, any tweet from any user with any follower count can spark a high-impact discussion. A good social strategy (combined with Twitter’s improvements to the product through threaded comments, etc.) encourages the audience to have their own discussions. Social relationship tools like Expion can help analyze and filter these conversations to uncover these“Moments of Spontaneous Conversational Combustion.” Instead of flipping randomly through hashtag searches or chronological mentions, a community manager could set up customized streams in their moderation dashboard based on keyword, level of engagement, or other factors. Assign community managers (either internally or at your community agency) to shows they have interest in. Your community manager is spending all day and night immersed in story lines, so that constant mutual excitement helps build deeper bonds with the audience and also helps your community manager to avoid burnout because they’re actually having fun. TV is highly polarizing. When you love a show, you can talk to anyone about it (people still talk about Lost and it ended years ago – I am one of those people). Execution is everything. You can’t expect to build a raving fanbase online about a TV show without having some great community minds behind your audience development who share that same passion. That’s why you need to hire amazing talent. Univision* might be the best example of a network who has blown up from their success with a social overhaul across all their shows from corporate-level primetime specials down to local social news teams. As a result, this summer Univision was the #1 rated network during July sweeps, beating out ABC, CBS, NBC, and FOX for the second summer in a row. Is your network primed for social engagement? If you haven’t started now, you’re behind. The distribution of content is only starting to really diversify. Decentralized platforms enabling viewers to watch wherever and whenever they want like Netflix, Hulu, WatchESPN, HBO Go, and even basic DVR are breaking the traditional discovery model that network executives have been used to for 50 years. As video becomes more fluid online, social engagement will become essential to finding and retaining loyal viewers for a show, as some have even said, social media is the new TV guide. Editor’s note: A version of this post originally appeared on the Expion blog. Nick Cicero is the Founder of Delmondo and a Digital Marketing Consultant with experience building social media strategies for Fortune 500 companies and many of today's top media/entertainment brands. He’s a fan of playing jazz trumpet and producing music. Nick lives in New York City.